This page is specifically for residents of Marana. If you need emergency air conditioning repair services in Marana, AZ, please use the coupons on this page and call our hotline at (520) 408-2665 right away. We have 24/7 urgent NATE-certified AC repair technicians ready to come to your home and fix any air conditioning issue, on any a/c manufacturer’s system. If you don’t want to spend hundreds of dollars fixing an air conditioning system that went down just because it wasn’t properly maintained, you need to set up a professional maintenance schedule with an air conditioning company that offers NATE Certified technicians. Keeping your air conditioning maintained by accredited professional A/C technicians on a regular schedule is mandatory to benefit from the manufacturer’s warranty. A/C manufacturers will void your warranty if you don’t get your a/c system maintained all year long. Take a look at your paperwork. This is a contractual requirement by the manufacturers. First measure to lower the cost of maintaining your a/c: making sure that it does not fail just because it wasn’t properly maintained. If you are already out of warranty: This is the case where you bought your system but your A/C manufacturer’s warranty was shorter than the lifespan of your system. It is still possible to get some coverage under a maintenance agreement: it is not the same as a warranty, but a good maintenance agreement will (a) ensure that NATE-Certified technicians inspect and tune-up your system on a regular basis, looking for any faulty or risky parts, and (b) when a part needs to be replaced, you get it at a discount. There are plenty of A/C repair companies in Tucson and Marana, so you have a choice. We at D&H Air Conditioning hope that you will give our company a shot at becoming your contractual a/c repair and maintenance company. D&H AC offers a maintenance plan named “Guardian Planned Maintenance”. Under this contract, we come twice a year to inspect your a/c system from the top down. When the season change, we do a tune-up, and we test all components of the system to ensure they function properly. Experience has shown that one failing component can trigger a series of problems, like one falling domino makes all other dominos fall, leading to catastrophic A/C failure. When this happens, this is usually at a cost of hundreds of dollars (if not more). Our Guardian Planned Maintenance contract deals with this risk: we test all components and identify risks of critical failure. We then give you a list of parts that present issues and could break down. We offer you to relace those parts at a discount. By doing so, we prevent catastrophic failures. Proper maintenance of an A/C system under a maintenance contract saves money. We serve hundreds of clients in Marana, maybe even your neighbor. We maintain a large fleet of trucks operation, and in Marana it is not rare to see five or six D and H Air Conditioning trucks in various neighborhoods in the same day. Is your own neighbordhood in the list above? If this is the case, please use the coupons above and when our certified technician comes to your home, ask him about the Guardian Planned Maintenance program. It won’t be a waste of time. On the contrary, it will save you bundles in the future. Marana residents: Give us a call at (520) 408-2665 to inquire about our Guardian Planned Maintenance Agreement or for any air conditioning repair services you may need. 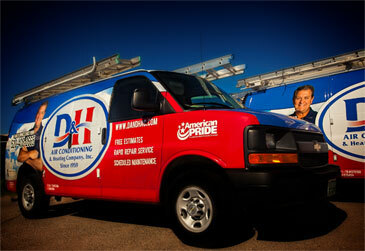 We are D&H Air Conditioning, serving the air conditioning needs of Southern Arizona since 1959.